It is here! 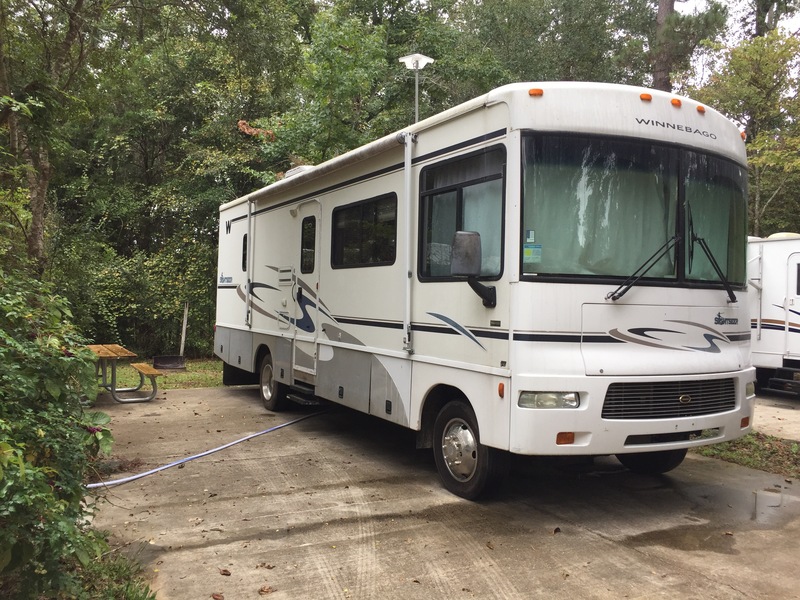 The first trip in the, “Renovated-New-2-Me-RVJedeye Mobile!” Ever since I picked up my Class A Winnebago Sightseer from Camping World, I’ve been dying to get out on the road. However as many of you know, I spent a lot of time renovating this bad boy, you can click over and see the full renovation series from start to finish, so it’s been a long time coming. For this first time out, I wanted to explore and be out there for a while, so I took a good chunk of Vacay and hit the road! It’s the closet I can get, right now to fulltime Rving and it was a blast! 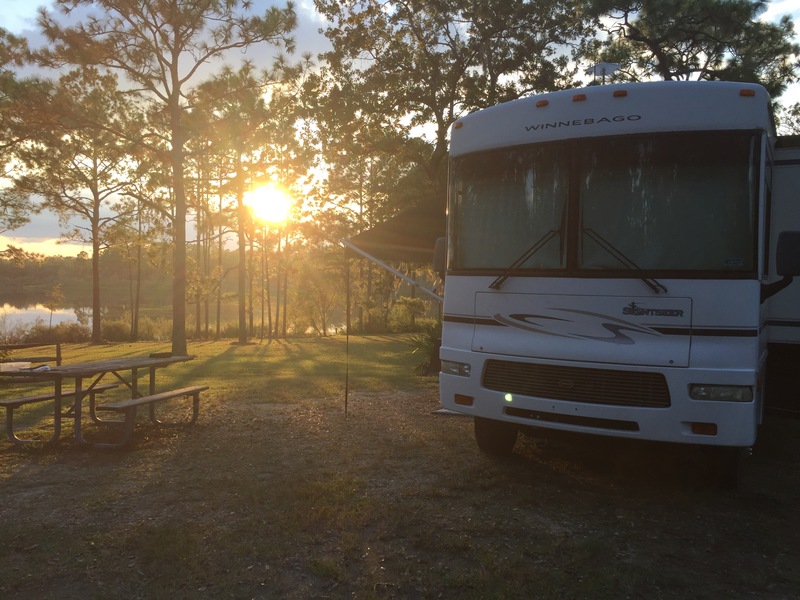 The first stop on my three park tour, was in Georgia at the “Eastbank Campground.” This was, without a doubt a beautiful location and a great park to take your rig in. It’s easy to maneuver and there are spots right up next to Lake Seminole or in the back of the park near lots of trees. 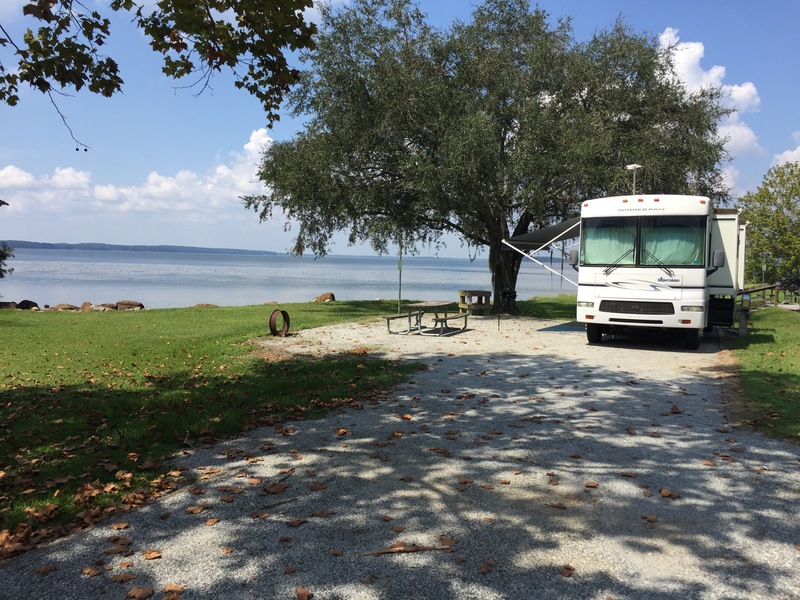 The campground in general is spotless and if you have a boat and like to fish, there is very easy access to the lake from a boat ramp on the other side of the park. In terms of hiking, there are trails in the woods, but one of the best places to hike is up near the Jim Woodruff Dam. It’s a cool spot to check out and from where I was you can walk through Georgia to Florida and hit two states in one walk! The cost to stay was really affordable at $24.00 per night. The one downfall and I can’t warn you enough about this, they have “Sugar Ants.” These bad boys will ruin your day if you are not prepared. You don’t even have to have food out and they will seek and invade your space. Make sure you bring ant spray and use it outside of your rig. I didn’t have any and learn that lesson the hard way, but made do initially with some mosquito repellent I had and then a couple who was staying next to me, had some ant spray and hooked me up. They showed me how and where to spray, all along the tires and any place around the rig it might look like an entry point. I quickly picked up some of this on the way to my next stop. Now those of you who’ve been following along with my RV journey may have heard me talk about this place before. In 2016, it was the site of my second “Epic Fail.” As I tried to get to the park before it shut the gate for the night and as you can tell, I didn’t get there in time. So this time around, I made sure to time it so I would be getting there during the day and boy or boy am I glad I returned! This campground is amazing. There are a mix of sites with and without water/electric. The site I had overlooked the lake and wasn’t too far from the bath house. The lake is gorgeous, the water clear and warm. There is a great hiking trail around the lake, which anyone can do and it’s a nice hike. There are also other locations to get a longer hike on as well. This bad boy is a hidden gem. Now cell service is not very good at all, so without a booster, it may be tough getting more than one bar out, but that’s OK, this is a perfect place to unplug. When I was there, there was no more than two other couples in the park at any one time. Everyone, was friendly and the park host, Bobby was very helpful and funny. Note, there is no place to dump your tanks, so you’ll need to find a place once you leave Camel Lake to dump your grey and black water tanks. I wrapped up my vacation, hitting another great Florida State Park, Torreya St. Park. Nestled up in the woods in Bristol Florida, this park was a nice way to close out a good trip. The campgrounds are tight, so be aware and it’s a little quirky because the way they have the sites laid out, some of the water hook-ups are on the opposite side of where your water connections are on your rig. Make sure you have a long enough hose to attach everything. The sites are also narrow and tight, but you should be able to get in and out pretty easily. When you look online to book your spot, it is a little deceiving, because it makes it seem like the river is really close by. The way the campground is situated, you’re up above, looking down at the river, so you’re not really close to it. Now you can hike to it and around the area and there are some really good trails. There is also an old Plantation home, the “Gregory House,” that was brought from across the river board by board and put back together overlooking the Apalachicola River which is a cool spot to check out on a hike. They also have tours of the home as well. All in all, my first trip in the rig turned out to be a great one and I can’t wait to get back out there and explore even more! P.S. We love your videos (we watch them as RandomBitsRV on YouTube). The parks look amazing (and they were ones we hadn’t been to in all our years of Florida/Georgia camping). Safe travels!